Though I’m not fully recovered from the Art Show (last year’s and the year-before-that), (at the school where I teach), Tuesday evening, or from teaching all day yesterday…I AM SO EXCITED to share with you a little step forward in some of the things I’ve been dreaming about for quite a while! My website, jenniferedwards.com, has been in renovation-mode for a while now. This is not due to the wonderful friend who creates my website, but due to my lack of direction, of which way to go, of how to use that site. Somewhere around the end of 2011, I had the idea to use jenniferedwards.com as a portal, from which you can jaunt to all the crazy places my creativity goes on the web! Click Here to go the actual website! The above is just a screenshot from my ipad to give you an idea of how it looks. 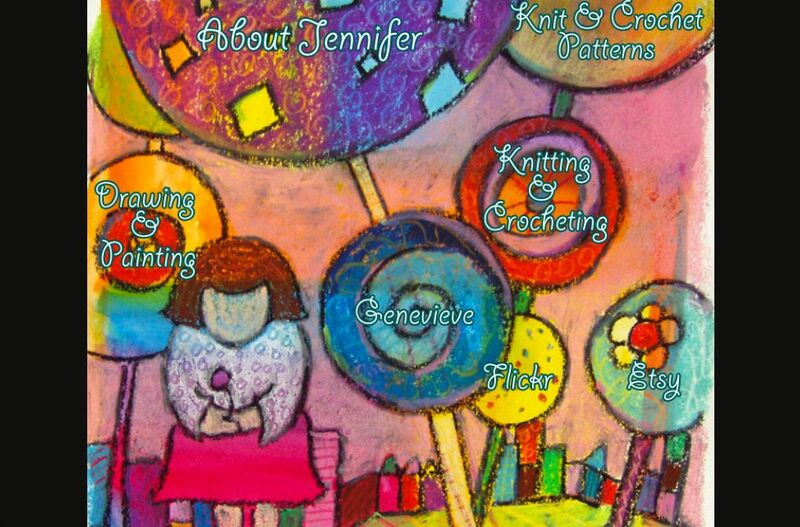 The screenshot crops it at the top and bottom, so you’re not seeing the whole page as you will when you visit jenniferedwards.com. I hope you have fun clicking around all the lollipop trees/flowers in my little web garden! There are so many other things in the works…I’m about to pop to share! But I won’t until they are fully ready. It won’t be long, maybe a day or two, maybe next week, or both! And so many to roll out…it will literally be weeks and months of Baby Step posts here on Drawn2Life! So I do hope you will pop back by for a visit! But before all that, I need a good nap! Whew! Putting on an Art Show for 150+ students, each displaying 6 pieces of 2-D and 3-D artwork, complete with reception and music, is quite an energy zapper! I’ll blog a little post to show you some pics from our wonderful evening! See you soon! Rest well, my precious one. Listen to the strains of the banjolele. So, I just go to Jennifer.com when I want to be cheery and thoughtful. Love the new website. May it always bring joy, comfort and encouragement to all who enter here as well as the soul who creates its content.. I had fun poking around all the various parts of your website. Nice to see it all together too. It looks great!